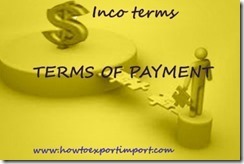 4 Different types of terms of payment in International Trade. If we do not go in detail about definition and deep parameters, I will call this slogan – ‘ Business is money’. 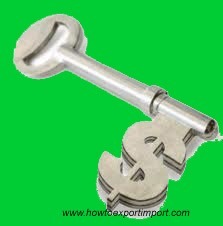 Although business man enjoy his day to day life in trade, if a loss occurs in business, everything collapse. So payment of any sales proceeds plays a very important role than any other roles in business. Most of the beginners of exports may worry about the terms of payment. Because, unlike other domestic business, you are dealing with a buyer who situates thousands of miles away from your place crossing borders of your country. You may or may not know the financial condition or credit worthiness of your buyer. You may not be meeting the buyer personally at initial stage, may not be aware of the specific policy of trade of buyer’s country, no idea about political status or natural calamity chances of the region etc.etc. Payment term in any business is a major part of sales contract. Terms of payment in exports and imports plays an important role in international business. What are the different types of mode of payment in exports and imports? Let us discuss different type of terms of payment in international trade. How to make payment to overseas seller in International trade of exports and imports? Letter of credit - How does LC work? What are the advantages of Letter of Credit to Exporter? How LC is benefited to Importer? Are there any disadvantages to importer for a consignment under Letter of Credit? What are the disadvantages of LC to an exporter? Who are the parties involved in Letter of Credit? How to check authenticity of LC? What is Prime Banker? Is DP terms of payment safe in export business? How does Bill of Lading work in DP payment terms? Documents against Acceptance are another term of payment in international payment. I have written a detailed article about DA terms of payment in same website. You may go through the same for further read. Can a Buyer (Importer) make part payment in Advance and balance on credit basis in exports and imports? I believe this article is only a window to have deep knowledge about terms of payment in international trade. I know, some of you may have a good experience in handling different types of terms of payment in exports and imports. I request you to share your experience about terms of payment in exports and imports. Comment below your thoughts on payment terms in international trade. Is D.A.P terms of payment safe in export business? Qazi Faheeem: On 28 August 2013 I want to know about terms of Payment in Export and Import. NAVED: On 13 September 2013 SIR, YOUR WEBSITE IS QUITE WONDERFUL FOR BEGINNER IN THIS BUSINESS AND ALSO THANKS TO FOR YOUR IMPORTANT ARTICLES. BUT ONE QUESTION I HAVE KNOW THAT IF ONE IMPORTER HAS FILLED BILL OF ENTRY AND EXAMINE THE GOODS BUT UNFORTUNATELY THERE DISPUTES ARISE BETWEEN IMPORTER AND EXPORTER AND GOODS WERE NOT NOT RELEASED FROM IMPORTER. NOW IMPORTER CAN GET CANCEL BILL OF ENTRY WHICH WAS FILLED. Surendran Kollerath: On 18 March 2014 Hi Armaan Singh, You may gently go ahead in setting up an export business. I have clarified all your doubts in different articles in this web blog. You may read all. Dhaya: On 25 August 2014 U done a great job, Thank u administrator for your useful concern and references, i am planning of import electronic goods and toys from china or from Japan. still confused on where to choose. please let me clear in this issue. R. L. Dhingra: On 21 May 2015 please educate me what are of credits in custom and import can be availed or taken for excise credit by industry in India when import goods received in factory. bimaldas: On 23 July 2015 I want to export flower in middle east country.pl.help me. Gopinath: On 23 August 2015 Hi sir iam going to start export of vegetables from chennai .How can i trust importers. anuvika jain: On 06 October 2015 Sir our team exported onions from india to dubai...nd now that buyer is not giving our payment...tha main issue is that neither we have Insurance by ECGC nor any other typee of security..what we can do now...what are the options available..??? ?plz rply..thank u..
usman : On 11 November 2015 i wan to export handmade bags how can i start this n i wan to importers for my electronic goods how can i get? Md.Adnan: On 27 March 2016 What is the maximum time period Exporter can give in DA Payment terms ? Sujith Sugunan : On 18 April 2016 However I have a doubt in our real business life or we facing a problem with one of our new buyer from Dubai. We got an export order for Coconut from Dubai and the buyer saying that the payment will be after arrival of goods(Not willing to do the LC also). Also they inviting us or our representative to visit their office for business confirmation. But now a days its not possible for us. In the above matter any possible and risk free way to do a business with this buyer? If after arrival of goods the buyer didn't pay, is have a way to extract our money? salim: On 01 May 2016 Wich is best pyment method credit export? Joshua V Abraham: On 18 May 2016 Mr. Sujith Sugunan, You can deal with CIF. It stands for cost, Insurance and freight should paid by you. So he cannot get the product before showing NOC paper to the shipping agent. You can issue the NOC after get paid. Jeevan Karuppasamy: On 31 May 2016 We have exported Semi-husked Coconuts to Dubai.The payment term is '100% on scan copy of shipping documents’.We have sent scan copy of documents to the buyer/importer. Believing the buyer's information that the payment was made by him, we have sent all the original shipping documents directly to the buyer.The buyer has informed that the consignment was received in good condition.But even after nearly 3 months lapsed, despite frequent reminders by e-mails and over phone calls, so far we have not received any payment.We are having all the documentary evidences Please guide us how to proceed for realisation of the payment from the buyer? George Melendez: On 06 June 2016 Is it true that Indian banking regulations do not allow for extended terms, must be t/t at site ? Ghulam Rasul Nasir: On 11 July 2016 After careful and deep study of the Article I am of the firm opinion that the material therein is very informative and supportive not only for the businessmen interested in Importers & Exporters but for the Bankers as well. abhishek bajaj : On 05 August 2016 We Want to start the exports to middle east countries and got to know that you ar the good advisors for the export. Rishank Pandey: On 16 August 2016 I saw your website, which is very encouraging for understanding the concept of export and imports. I'm working in a bank in Delhi as a Relationship Manager in Corporate Banking, can you please advise the consultants who are dealing in import / export business. Ajay Kumar : On 16 August 2016 Can u tell me what is different in export and import. Rajalingam Industry: On 05 November 2016 Dear Sir, I am manufacture and supplier of Cotton Knitted and Hoisery Hand gloves in India. I would like to do export of my products. I need export orders. Please let me the prodcedure to get export orders. Akash Agro Industries : On 08 April 2017 Dear Sir Hope you are in good health, Further to inform, you that we have done one shipment to the mexican buyer and we have given material on credit of 90days but after 90days buyer haven't paid us and its now 150days and we havn't got any payment from the buyer. Please suggest us what we can do to get the payment. Tejas Shah : On 24 April 2017 We are facing a problem as have shipped a consignment where we are facing payment issues from our buyer. 1) Our export sales is against sight LC to Bangladesh. 2) We shipped consignment by sea. 3) We have submitted all documents in our bank. 4) We have proof that buyer has already released the documents and take delivery of the goods. 5) We have not received any payment nor any swift copy of payment. 6) Now buyer is raising quality complain for this cargo after taking the delivery. Please let us know your view in this matter. hummer rock : On 15 July 2017 Thank you so much for your articles which has helped very much for beginners like me in Export and Import. I am into import business currently, I import raw materials of Agarbathi from China and Vietnam. I am now stuck in a dilemma, I have found a supplier in China who has offered us competitive price and thus I proceeded further with the same. The bank account details he has provided is of a Bank in Hong kong, when asked him about it he said that he has other company in Hong kong for foreign exchange, he does not have account in China because of tax evasion. He has to say that having company account in China will cause them more taxes and hence they cannot offer the competitive price which he has offered us. So my question is 1) Can i make the payment to Hong kong and get goods from China ? The company name in China is different and in Hong kong its different, he has invited me to China to visit their factory and then make payment. He has to say that his other Indian customers does it in same way(i.e pay to hong kong and get goods from China). I would be very grateful to you if you could please advice me if this kind of system is permissible. Kanaiya: On 05 September 2017 I want to make import payment from my two different bank partially as a buyer, whether it's possible as per RBI guidelines ? Suleiman Abdulkadir : On 14 October 2017 Quite interesting and informative.